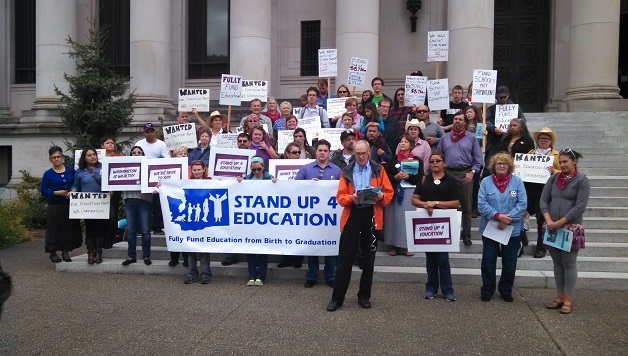 Socialist Alternative members, together with labor leaders, teachers and parents protested Washington State’s criminal underfunding of education. In the 2012 McCleary ruling, the State Supreme Court found that Washington had violated the State Constitution by failing to adequately fund education. In January 2014, the Court demanded a plan to show how funding would be increased – which the state government failed to provide. The September 3rd hearing was held to determine whether the state government was in contempt of court. Education activists pointed out that the state could make time to hold a special session to give Boeing an $8.7 billion bailout, but has failed to take serious steps to find the $7.8 billion for education demanded by the courts. Protesters handed in a letter, signed by Socialist Alternative Seattle Councilmember Kshama Sawant, State House candidate Jess Spear, WFSE local 304, education campaign groups and activists. The importance of the court resolving the lack of full funding to Washington’s public schools through the McCleary ruling cannot be overstated. As the economic crisis and resulting stagnating economy exacerbates the Opportunity Gap, students come to school with even greater needs and the public schools continue to be expected to be the ‘Great Equalizer.’ Without sufficient funding to do so, the burden falls yet again on educators who continue to dig deep into their own pockets and hearts to help their students, all the while the state places even more burdens on them in the form of more standardized testing and cumbersome evaluation procedures that rob students of instruction time. McCleary represents an opportunity to restore funding and reduce class size, increasing individual face time between students and teachers and thereby student learning. The court has the chance to turn public education into the empowering tool that our students need and many hope it can be. School kids don’t want to play politics. Teachers don’t either. Citizens are fed up with the game of pandering to tax-haters at the expense of our most vulnerable people. A civil society requires resources to function and the legislators who say their voters don’t want revenue for ANYTHING should not commandeer government for the general populace. The voters who elect those NO REVENUE UNTIL REFORM law makers are, themselves, uninformed about the true cost of education and, more importantly, the true costs of NOT funding education. When our classes are so big that we can’t reach every kid every day, we aren’t teachers anymore – we are low wage workers who leave the profession out of sheer despair. There aren’t magic and cheap solutions to teaching children, as much as people want to believe that there are. We want kids to learn and be confident humans – that is why we went into this line of work. Give us the tools; we will build a bright future. Teachers are not going to play nice forever. Resistance to corporate reform and subsequent underfunding is mounting and kids deserve – NEED – badass teachers to be leaders in every part of the system. Previous articleBuild a Movement to End Poverty Wages!